Alcohol is a poison. When a woman is pregnant, the fetus consumes everything the mother consumes. So, when a pregnant woman drinks alcohol, so does the fetus. Now, do a mental comparison of the immune system of a twenty-something-year-old woman and the immune system of a fetus, or lack thereof. Mommy might feel a little buzz, but her baby is being directly poisoned by alcohol. If mommy keeps this up, her baby will likely develop fetal alcohol syndrome, or FAS. One full percent of all births produces babies with FAS. This might seem small at first, but consider the fact that there are well over 10,500 births every day. This means every single day there are nearly 30 children born with FAS. It is a completely preventable condition. Mothers simply cannot drink alcohol while pregnant. Let’s discuss the history of FAS, the symptoms, how to best prevent it, and what’s being done to combat this horrible syndrome. Back in the 1930s, organizations such as the March of Dimes, founded to combat polio, helped to eventually shine a light on fetal and early childhood development. Forty years later, in 1973, what would become known as FAS was first studied by David W. Smith and Kenneth L. Jones, pediatricians who specialized in dysmorphology, the study of congenital abnormalities during development, at the University of Washington Medical School. Drs. Smith and Jones studied a group of eight children who all displayed similar abnormalities and determined that, of the eight children, four of them were born to alcoholic mothers. Smith and Jones surmised that during their fetal development, alcohol acted as a teratogen – a factor causing embryo malformation. The abnormalities observed during the study were attributed to the first diagnosed case of Fetal Alcohol Syndrome. They included growth deficiencies, facial abnormalities, and damage to the developing brain that can result in behavioral, learning, and cognitive abnormalities. Around the same time in the 70s, French pediatrician Paul Lemoine conducted a study involving 127 children in which the mothers were diagnosed alcoholics. Alarmingly, the study found that 105 of the children (83%) not only suffered from FAS, but had also been institutionalized as a result of their handicaps. Imagine how many babies were born with FAS prior to it being a diagnosis? Alcohol has been consumed by humans for over 4,000 years! In 2004, a meeting was organized by the National Organization on Fetal Alcohol Syndrome (NOFAS) which included experts from the CDC, the National Institute on Alcohol Abuse and Alcoholism, and the Substance Abuse and Mental Health Service Administration, among others. The goal was to offer a clear definition of Fetal Alcohol Syndrome and its many symptoms and effects. Because there were so many, the term ‘Fetal Alcohol Spectrum Disorders’ (FASD) was coined to describe the effects of alcohol consumption during pregnancy. Each previously mentioned study, and the 2004 meeting, all reached the same obvious conclusion: drinking during pregnancy is harmful to the fetus and results in various behavioral and cognitive abnormalities throughout the life of the child. You might ask what those abnormalities are. Well, there are plenty of them, and none of them are pleasant. Children with FASD which was identified early have an improved prognosis. A child who is identified early in life can be placed in the appropriate educational classes and be given access to social services that can help the child and his or her family. In addition, early diagnosis helps families and school personnel understand why the child might act or react differently from other children in some situations. Many symptoms of FASD are also symptoms of other disorders. 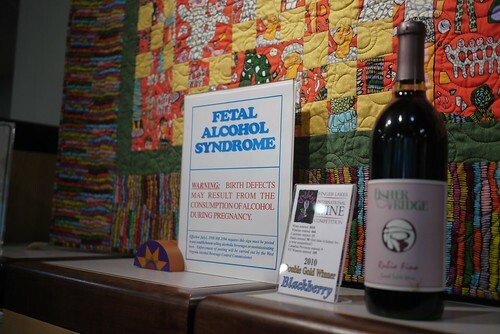 Fetal Alcohol Syndrome is 100% preventable. That being said, prevention should not fall solely on the shoulders of the expectant mother. According to both experts in the field and women’s health service professionals, support should be provided by the father and by society as a whole. Not only do some women become pregnant while alcoholic, but some women cope with the pains of pregnancy using alcohol… at least one percent. Public Education: Posters, lectures, brochures, and media exposure are all tools which can be used to educate the public concerning the dangers of alcohol use during pregnancy. Professional Training: Healthcare and social service professionals are becoming more knowledgeable concerning FASD, receiving knowledge which can be passed down through seminars and meetings. Professionals should be trained in how best to approach women about not drinking during pregnancy and how to aide women to stop drinking. Public Policy: Every level of government deals with FASD. Surgeon General’s warning labels on alcoholic beverages, and laws which require certain individuals to report to the state if and when they are aware of a woman drinking during pregnancy, are examples of public policy. Many more exist. Programs and Services: There are programs and services available which support drinkers during and after pregnancy. Also, there are interventions held to confront pregnant drinkers. Parent and Citizen Activism: Parents and ordinary citizens can be active and involved in the prevention of FASD. A simple Google of ‘FAS Prevention near me’ should generate some relevant results. If you are aware of the many consequences of drinking, and you are not pregnant, choosing to drink is your choice alone. As a pregnant woman, that choice is now split between the two of you. FAS and FASD are realities. It’s a guarantee that no mother of a child with FASD would say that the nights of drinking were worth it. So prevent it. DO NOT DRINK while pregnant – it’s ultimately that simple.